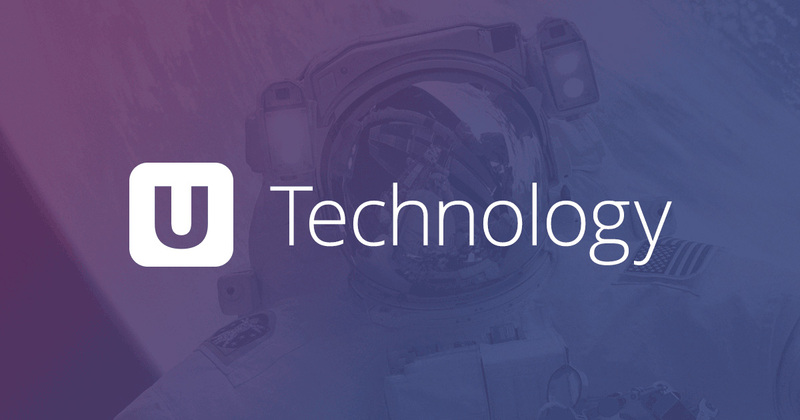 Tech Turf is Presenting here the article to tell the basic understanding of EDI. Electronic data interchange (EDI) is the latest technology by which you will be able to send your important documents from one computer to another in a secure way. 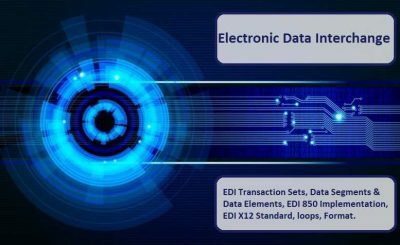 Here, we are providing complete information about the basics of electronic data interchange that will be useful for you to understand it in a better way. The Simple definition of edi is as follows,” the interchange of electronic documents in a standard format from one electronic device to another in a secure way is called EDI. Previously, the business documents were exchanged through paper-based format but now in the modern era the business documents are exchanged electronically from one computer to another and there are many benefits of doing that. there are many advantages of using EDI in organizations such as a reduction in cost, increase of processing speed, reduction in errors, improvement in security etc. Electronic data interchange is the exchange of electronic files in a standard format that is easily process-able by a computer so that the exchange can be automated without any human intervention. Following is the complete meaning of EDI definition elements that will help you to understand the EDI more better. What is meant by “One Electronic Device to another”? EDI is the new era of technology, It had replaced the old technique such as postal services, email, fax etc. as we all know that the email is also a digital method to send the documents but it does not come under EDI because it is handled by human rather than electronic devices such as computer. when the human intervention comes in any process, it make the process very slow and less secure, it also includes many errors in the process. But, If you talk about edi documents, it directly goes to the receiver’s electronic device and the processing of the information done by the computer itself in a very quick way. You will be able to understand the difference between the manual process and edi process for the interchange of a document by following images easily. What is business document in EDI? These are any normal kind of document that is usually exchanged between one business to another. Purchase orders, ship notices and business invoices are the most conman examples of electronic data interchange documents. But there are many another kind of documents that are sent over EDI network such as billing documents, logistics and inventory documents, business proposals etc. What is meant by Business partner in EDI? In EDI Process, there are two ends, one is the sender and other is a receiver. These ends are mostly two different companies or organizations that are exchanging their important document with each other through edi. these companies are termed as trading or business partners. What is meant by Documents Standard format in EDI? 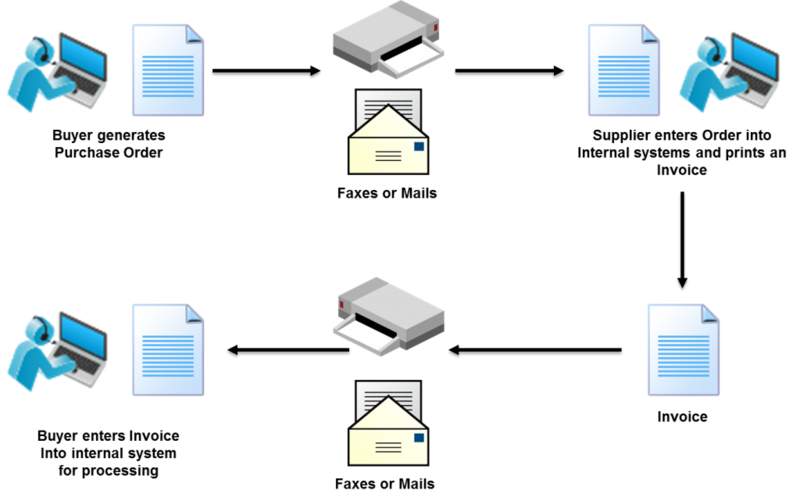 In the process of electronic data interchange, the documents are processed through electronic devices such as a computer. the document sent over the edi network must have a defined format so that the electronic devices could be able to read and understand it. You can assume the standard format as the defined place for every unit in the document. A standard format of EDI documents defines the format of a document such as decimal, integer, mmddyy, language etc. It also describes each part of the information contained it in the document. if different edi document formats are used in the edi process then it would not be understood by another computer. It would create a situation as a french speaking man is trying to understand an English document. EDI Document formats: Now a days, many edi formats are in tradition such as ODETTE, VDA, EDIFACT, ANSI, TRADACOMS, ebXML, HL7 etc. there are many different kinds or versions of every edi standard i.e. ANSI ASC X12, EDIFACT version D12, ANSI 5010. 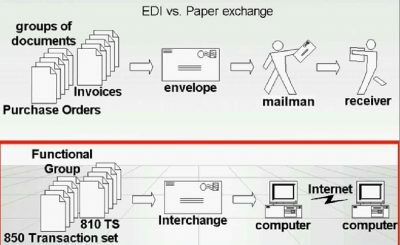 To exchange the documents over edi network, the sender and receiver end of computers must use the same edi standard version. Use of EDI Translator: Many organizations use edi translator, it is used to translate the electronic data interchange format in the internal application format of orgenization so that the organization computer can understand the edi document and start processing it immediately. Organizations use the edi translator as an in house software application or they take help from edi services providers.